TAMPA, Fla., Aug. 25, 2017 (SEND2PRESS NEWSWIRE) –- President John F. Kennedy quoted the Irish statesman Edmund Burke when he said, “The only thing necessary for the triumph of evil is for good men to do nothing.” Joshuacord, a non-profit 501(c)(3) organization, is taking those words to heart by combatting a widespread and devastating form of evil – the ruthless persecution of faithful Christians – by holding the fifth annual Joshua 1:9 Freedom Run at 8 a.m. on Saturday, November 18, 2017, to bring awareness to the plight of persecuted Christians and raise money to support the persecuted church. The Freedom Run will consist of a chipped 5K course for those interested in running/walking the full distance, a shorter 1 mile kid friendly fun run/walk, and an opportunity for supporters to participate virtually from anywhere in the world if unable to attend in person. The run will start and finish at Al Lopez Park: 4810 N. Himes Ave., Tampa, FL. Organizers expect approximately 350 participants and stress that this family-friendly event is open to everyone – runners, walkers, and supporters. Participants can register online via Active.com or mail in a registration form which can be downloaded at: http://www.joshuacord.org/5k. Additionally, there will be an opportunity to register in person on the morning of the run. All registrants, including those who participate virtually, will receive a race packet and a Dri-FIT race t-shirt in appreciation for their support of the persecuted church. Early registration is $25 ($20 for active duty military) and will be open until November 10, 2017. After November 10 and up until the day of the run, registration will be $30 for all participants. Every dollar paid in registration fees will go directly to support the persecuted church. Additionally, there will be an opportunity to donate baby blankets, gloves, mittens, and hats, at the run. All donated items will be mailed directly to Christian refugees in the Middle East prior to the start of winter. In addition to the Joshua 1:9 Freedom Run, Joshuacord is working on a documentary that advocates for its Christian brothers and sisters. 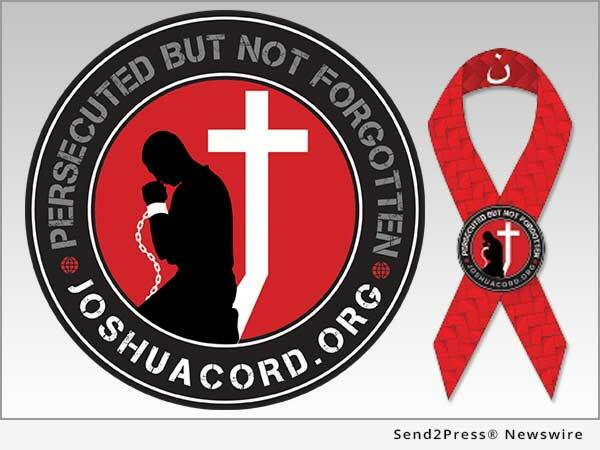 Joshuacord has teamed up with In Altum Productions, and film director, Jordan Allott, in an effort to promote solidarity and demonstrate support for those being persecuted for their Christian faith in northern Iraq, Syria, Pakistan, Egypt, Sudan and other parts of the world. The documentary trailer – “Christians in the Mirror” – will be released and distributed to all race participants at the Joshua 1:9 Freedom Run. 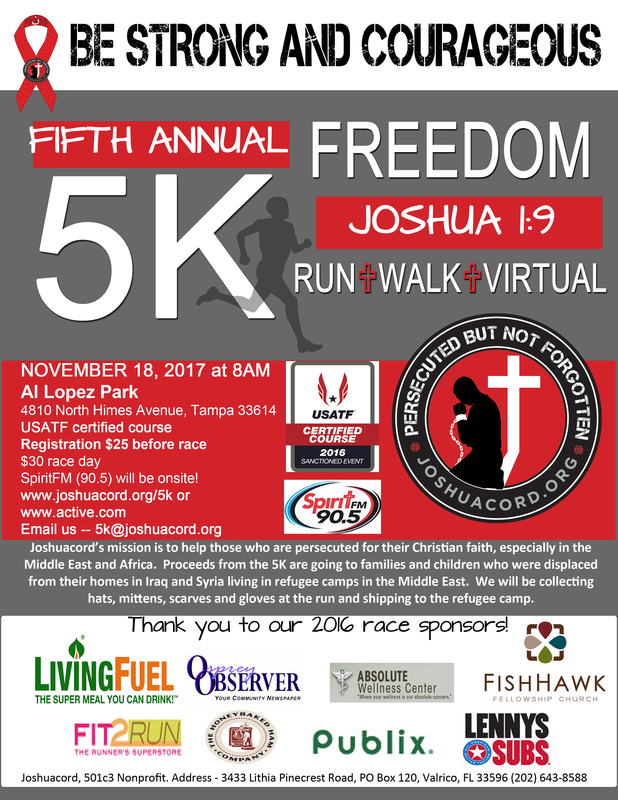 Please join the Joshuacord team for the fifth annual Joshua 1:9 Freedom Run on November 18, in Tampa or as a Virtual Participant, and show your support for the Persecuted Church. 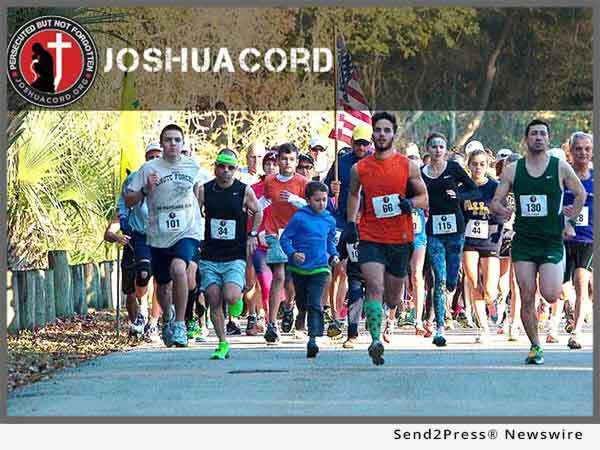 "The Joshua 1:9 Freedom Run gives all Christians an opportunity to show their support for fellow believers across the globe," Patrick Carberry of Joshuacord, Inc. says.